As we recover from hurricane season, it’s time to acknowledge flood risk communication is hindering resilience. Arcadis’ Roni Deitz, discusses why shifting the conversation may better prepare communities. Download the Bridgeport Atlas to read about Bridgeport’s history, ecosystems, development and neighborhoods. 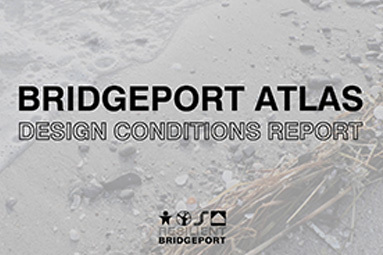 Read the Design Conditions broadsheet to learn about existing conditions in Bridgeport and the South End. 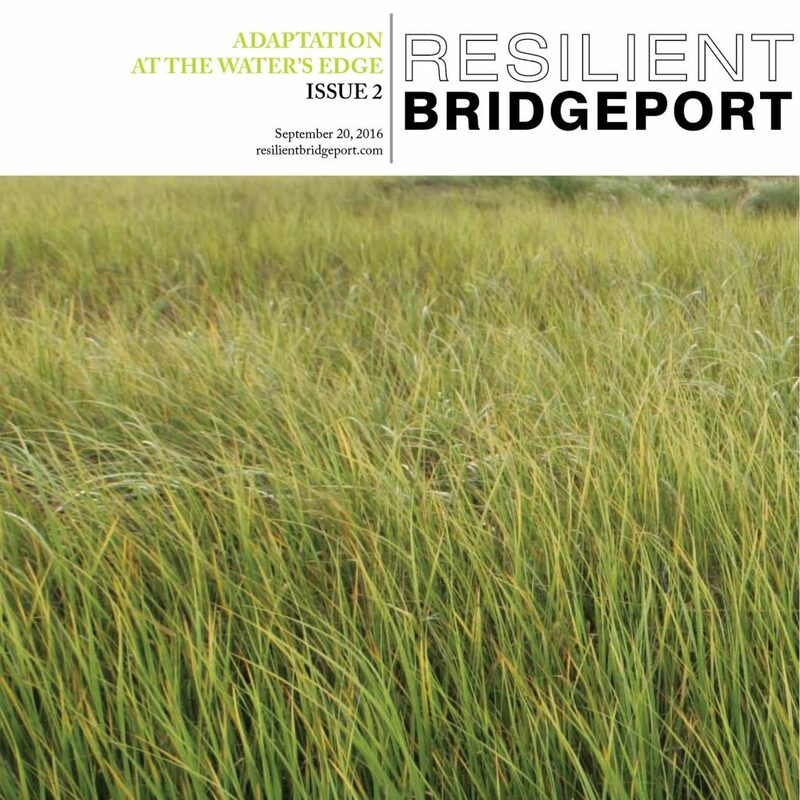 The Adaptation at the Water’s Edge Broadsheet contains information about resilience and adaptive measures in the face of climate change. The Resilient Bridgeport team hosts public events, information meetings, hearings and workshops in and around Bridgeport’s South End. Documents and resources from past events are cataloged below by event date. Sign-up to receive email notifications for upcoming public events below. A public hearing was held on Tuesday, February 26, 2019 offering a presentation on the project and provided an opportunity for oral comments. Following the public hearing, guests were encouraged to participate in a Design Workshop. The Design Workshop illustrated the different elements of the overall design, as well as provided the opportunity for community feedback. The Design Workshop focused on two significant design items- “Head of Park” and the Resilience Gateway, and Stormwater Management at Soundview Park. A 3D model offered an interactive look at current design plans at these locations. A Public Information Meeting for Resilient Bridgeport was held at the Schelfhaudt Gallery located in the Arnold Bernhard Arts and Humanities Center, 84 Iranistan Avenue in Bridgeport, CT to provide a project update and open community discussion on design alternatives. The presentation included updates on project progress, the EIS process and design alteratives. Attendees were encouraged to stay following the presentation to speak with project representatives and provide input to design alternatives. A Public Hearing & Design Workshop for Resilient Bridgeport was held at the Schelfhaudt Gallery on the first floor in the Arnold Bernhard Arts & Humanities Center located at 84 Iranistan Avenue in Bridgeport, CT. The Public Hearing began with an open house and opportunity to speak one-on-one with project staff. A presentation on the Environmental Impact Statement (EIS) / Environmental Impact Evaluation (EIE) was given. Following the presentation, the public had the opportunity to provide comments. After the hearing portion of the evening, attendees were encouraged to stay for a design update and public workshop. A Public Information Meeting for Resilient Bridgeport was held on Tuesday, December 12, 2017 at the New Vision International Ministries located at 130 Gregory Street in Bridgeport, CT to provide a project update and first look at design concepts through an interactive workshop. A Public Information Meeting for Resilient Bridgeport was held in the Littlefield Recital Hall at the Arnold Bernhard Arts & Humanities Center in Bridgeport, CT to provide an overview of the program as it launches into the next phase: environmental review and preliminary design for both the National Disaster Resilience (NDR) funded and Rebuild by Design (RBD) funded projects. Together, these investments will build the foundation for long-term economic, environmental and social resilience in the South End of Bridgeport. The design team hosted a lecture on hydrology and groundwater from Roelof Stuurman of Deltares at the Resilient Bridgeport Design Center at 7 Middle Street in Bridgeport. Roelof Stuurman is specialist in integral management of environment, water, and soil. His research explores hydrogeological systems analysis on a regional and local scale in support of spatial, environmental and water policy planning. Roelof discussed groundwater issues and precedent cities in the context of Bridgeport. The Rebuild By Design Resilient Strategies Open House and meetings were hosted on October 10th, 2017 at 7 Middle Street in Bridgeport, CT to publicly preview the advances to the Bridgeport’s Design Strategies Report. This event was an opportunity to comment on the Resilient Bridgeport Strategies final draft. Design team members were available to answer questions from 9 am – 7 pm. There were three area specific meetings: Black Rock Harbor and Cedar Creek at 10 am, Downtown and the East Side at 12 pm, and South End at 6 pm. 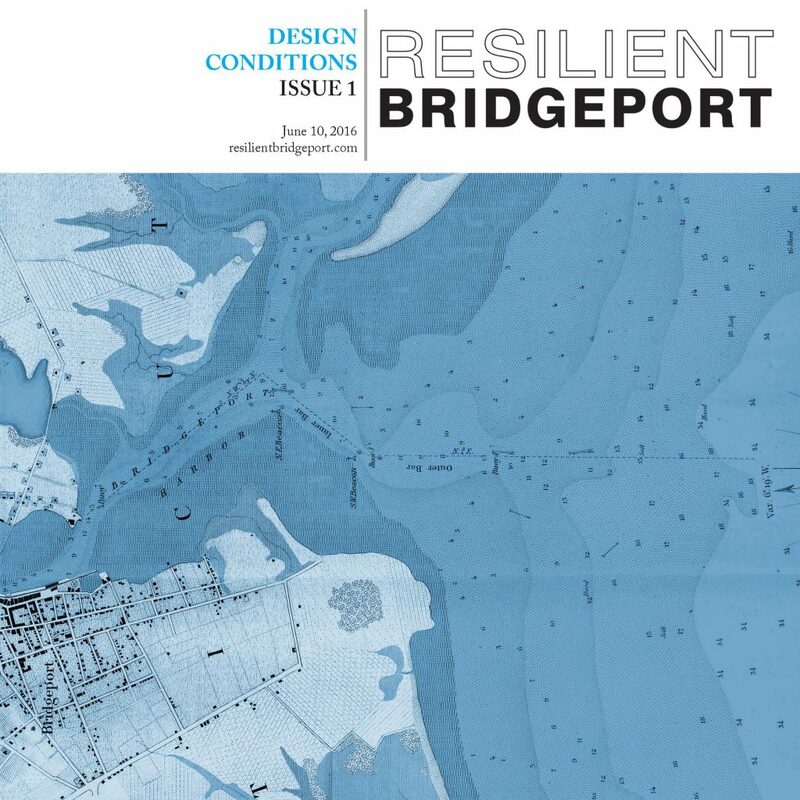 The Resilient Bridgeport design team hosted two public workshops on April 12th. The Park Planning Workshop geared towards children was held at the Marina Village Community Room from 12 p.m. to 2 p.m on Wednesday, April 12th, 2017. 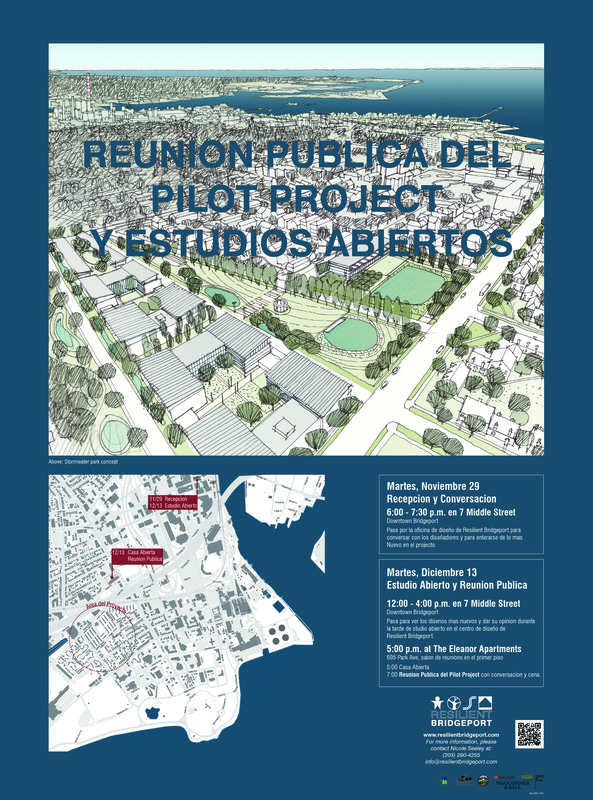 The Pilot Project Development Workshop started at 6 p.m. at the Eleanor Apartments Multi-Purpose Room, 695 Park Avenue. 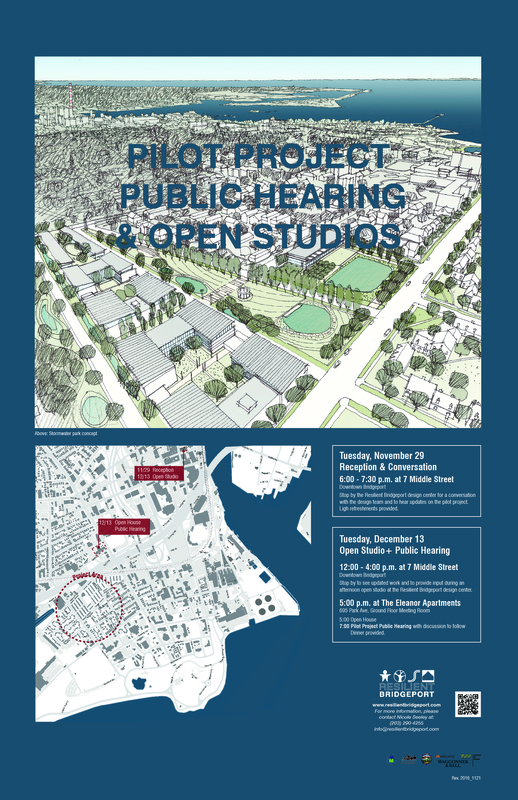 The Resilient Bridgeport design team hosted an Open Studio and Public Hearing on December 10th. The Open Studio was held at the design center at 7 Middle Street from 12 p.m. to 4 p.m on Tuesday, December 13th. The Open House started at 5 p.m. at the Eleanor Apartments Multi-Purpose Room, 695 Park Avenue. This was followed by the DOH hosted Public Hearing at 7 p.m. The Design Team hosted an event at the Design Center to collect input on the pilot project alternatives from residents and stakeholders. This event circulated community members through stations to gain insight on specific components of the project. Stakeholders, community members, the design team, Connecticut DOH, HUD, and Rebuild by Design representatives came together at the University of Bridgeport for a three part workshop that began with a presentation by the design team of the components of the resilience strategy and of project alternatives, breakout groups working with topographical models, pins, and string to deepen their understanding of project alternatives and design principles, and ending with workshop participants presenting their insights and ideas for project possibilities to each other. The design team joined Marina Village residents, PT Barnum Housing residents, and other members of the public for an introduction to the Resilient Bridgeport project and process. 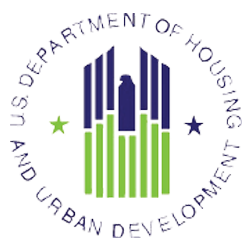 The design team invited attendees to participate in the July 23 event at the University of Bridgeport. Bridgeport residents, regional historic preservation officials and experts, local scientists and designers, and design team members gathered in downtown Bridgeport for “Culture & Climate.” The afternoon began with lunchtime lectures by representatives of the Union of Concerned Scientists and the National Trust for Historic Preservation. Participants then worked in two groups to tackle critical issues such as sea level rise projections, dry egress, different strategies for addressing chronic flooding and storm surge in the low-lying areas of Bridgeport, and selection criteria for design strategies and the pilot project. Participants then departed on foot for key sites in the South End. 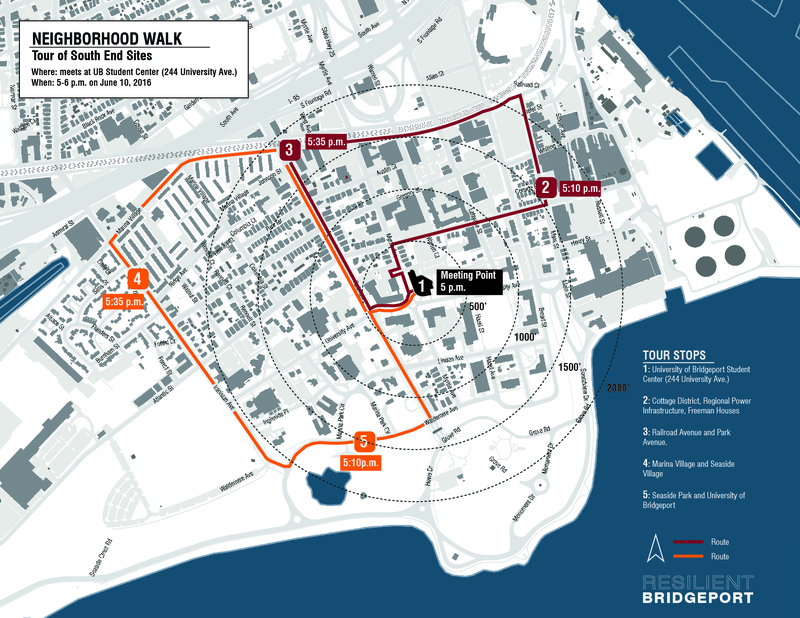 One group visited the University of Bridgeport, Seaside Park, Seaside Village and Marina Village. The other group made stops at the Cottage District, Freeman Houses, Park Avenue and railroad intersection, and Marina Village. At these locations, community members shared stories about the South End and from their personal histories, and even opened up their homes and gardens to tour participants. The Resilient Bridgeport design team hosts workshops and public events in the South End and at 7 Middle Street in downtown Bridgeport. 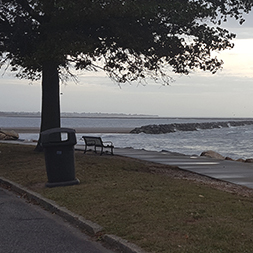 Sign up above for updates and to learn more about coastal resilience and planning efforts. Documents and resources from past events are catalogued below by event date.